A dire warning that we have just 12 years to save the planet from climate change comes three decades after global warming alarmists began saying, "time is running out." "The world has just over a decade to get climate change under control," reported the Washington Post. "The world stands on the brink of failure." "Planet has only until 2030," said CNN. Luckily, the New York Times gave us 10 more years. This time it's another "landmark report" from the United Nations predicting "wildfires, drought, food shortage, and severe poverty across the globe." The only solution, naturally, is more government. The U.N. Intergovernmental Panel on Climate Change advises "rapid, far-reaching and unprecedented changes in all aspects of society." The report "is quite a shock, and quite concerning," said Bill Hare, a climate scientist who has worked with the IPCC. "We were not aware of this just a few years ago." Actually, it is far more shocking for Hare. After all, he has "contributed actively to the development of the international climate regime since 1989," back when they were saying the same thing. "In a simpler time, not so long ago, environmentalists talked about saving forests for hiking, streams for rafting and clean air for the pure enjoyment of breathing it," the Los Angeles Times reported in October 1989. "Now, as the 1990s approach, the talk has turned to the science of survival—saving forests for oxygen, keeping streams from spreading toxic pollutants, cleaning the air to avoid catastrophic global warming." At the end of the 1980s the message was the same. They just called it "global warming." "The threat of environmental cataclysm is replacing nuclear holocaust as the most frightening menace to civilization," the LA Times said, warning we must stop polluting or else. "By many measures, time is running out," the environmentalist group Worldwatch Institute warned. "Oceans would rise, deserts would spread, forests would die. People would starve," the LA Times said. Sounds familiar, probably because we've heard it regularly in every decade since. We heard it in 1992. And 1993. And 2007. And 2017. In 1992, the New York Times was warning of the coming ice age in the "decades ahead." By 2007 the U.N. was out with another dire climate report. Hare wrote it. 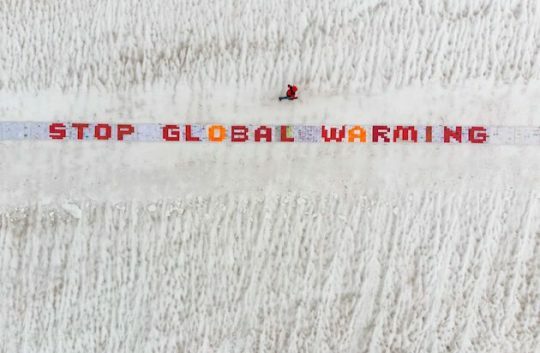 Global warming would bring "further melting at the poles, sea levels rising high enough to submerge island nations, the elimination of one-quarter or more of the world's species, widespread famine in places like Africa, more violent hurricanes." The report painted a "grim and powerful assessment of the future of the planet," the Times reported, warning of an "urgent need to limit looming and momentous risks." It was "the most sobering view yet." That is, until the next "terrifying warning." This entry was posted in Issues and tagged Climate Change. Bookmark the permalink.